Earn $1.70 in Rewards credit (170 points) What's This? Make flats a thing of the past. 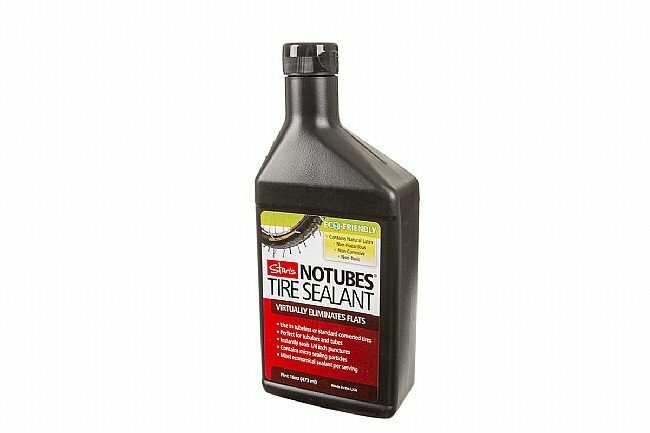 Stans NoTubes Tire Sealant uses proven "sealing crystals" to repair small punctures and larger cuts. The low viscosity formula allows it to coat the entire inside of your tire for effective protection, wherever you need it. Two ounces is all you need to seal most road or MTB tubeless tires. Stans Sealant can also be added to any inner tube or tubular tire with a removable valve core. The sealant stays liquid for 2-7 months, and is non-hazardous, non-toxic and safe for the environment. 16 ounce bottle (up to eight applications). This sealant is the best on the market. I use road tubeless and have had Stan's still work 8 months after originally filling. Great product. First time using tubeless on cross bike, holds pressue great. After installation no lose of pressure, went a week before i had to top off. Does the job... as usual! Works great! Fill the tire once and it's good for, well almost forever, or at lest the lifetime of the tire. I regularly ride areas with a basketful of hazards, thorny cholla balls being most prevalent, and all I do when I get home is break off the spikes at tire level and leave them in the tire. I just replaced a tire I wore the tread off and it still had the original fill of Stans doing it's job. When I took the tire off, the inside looked like a forest of spikes, made up of all the spikes picked up in the lifetime of the tire. Best thing I did to completely stop goat head flats. Used Stans for years. Great stuff. Lots of miles and lots of trails. Works very well. Installation was pretty easy. Works good so far. Converting my tires to tubeless was a breeze. Stan's tire sealant is reliable and lasts a long time. I've used Stans on my tubeless mountain bike tires for a number of years. I've never knowingly had a puncture and certainly not a flat, while many people riding with me have had numerous flats (very annoying slowing down the ride like that). Well maybe I'm lucky and maybe its the Stans. Certainly easy to use. With UTC tires I would seldom have to add air. A little more frequently with TR tires. I put about 2 oz. in my 23mm road tire. So far I have not had to plug a leak. Stan's works really well in the tubeless tires....make sure you put enough in as it eventually does get dry. Definitely helps if you get a puncture! Very good stuff no flats. Works very well seals holes very quick. Don't have to put air in tires as much on road bike or mtb. Use it in bikes and truck! Works for my road tubulars, MTB tubeless and auto tires!! the liquid awesome is made of! Riding Stans is the only way to go. Seals up great, and longevity in the tires is good. I usually renew my Stans mid summer and have not had punctures in years with it (sidewalls are another story though). I tired a suggestion of putting a 1/4 -1/2 teaspoon of glitter in the tire with the Stans and it seals up cactus punctures faster than Pantani went uphill on PEDs. Stans is one of the industry leaders in tubeless technology. I have used this sealant for years in my mountain bike tires and never had a leak. If I ever go to tubeless on my road bike, this is the stuff that I will use without question! The price is a little high, but I catch it on sale here which helps and it is better then any shop around here. Was able to go tubeless for the road. So liberating. I feel like I'm going commando...wait, I do!